Google Allo is a messaging App launched by Google. This app combines the best features of most of it popular counterparts to offer its users a great IM experience. In its latest version, Allo has added a new feature, which allows it to run on PC as well. The only limitation is that you can use it only in chrome browser. 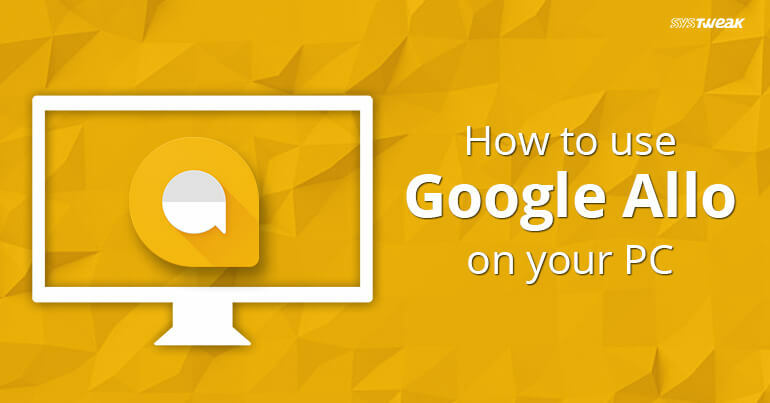 We will discuss the steps on how to get Google Allo started on your PC. Open Chrome browser and type allo.google.com/web. This will open the page with a scan code. Now, launch Allo application on your smartphone and tap on the Hamburger menu located at the top left corner of the screen. Tap on Allo for web. Tap on SCAN QR CODE button. This will open the camera of your smartphone. Scan the QR code displayed on the computer using your phone. Once the app scans the code, you will be automatically logged into your Allo account and can enjoy using the app over your PC. Allo can only be used in Chrome browser. Both the devices, your phone and PC need to have an active data connection. Allo on web, syncs the data from the mobile app of Allo running on your smartphone. Therefore, in case your phone’s battery is dead or your app is not responding then you can continue with Allo on web. This feature is only available with the latest version of Allo app(Android) i.e. version 16. iOS users still must wait. How To Sign Out From Allo Web? You can sign out from Allo web by two ways, one is directly from the PC on which you are using it and other from your smartphone. It is always a good practice to sign out from your account if not in use. Open Allo web and click on your profile picture. Now, click on Sign Out, to sign out from Allo web. You have to rescan the code whenever you again wish to Allo web. Google Allo gives you an alternate option to sign out from Allo web. You can log out from the app. Tap on the Hamburger menu located at the top left corner of the screen. Now tap on Allo for web. Tap on “Sign out all computers” to logout from Allo web. The best part of using Google Allo on web is that you can use it with Google Assistance. Try out the latest features of Google Allo and let us know if the above article was helpful to you.